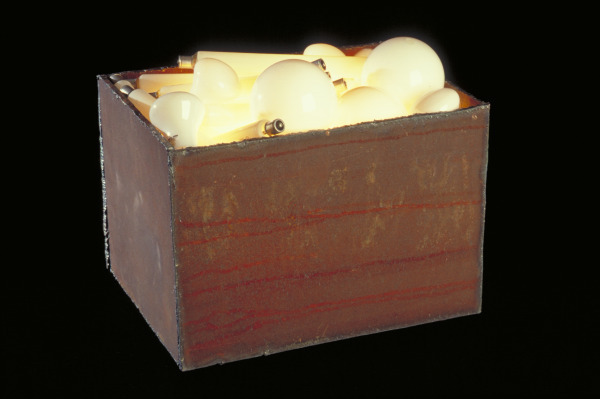 Box made of rusted sheet steel, containing light bulbs in numerous shapes and sizes. 1/4" rusted plate steel, welded construction, sheet steel insert carrying wire bulbs (x 4). Assorted opal finish bulbs, various sizes and shapes acting as diffusers to lit bulbs. Part of ongoing collection exploring self referencing of lights and furniture in a modernist context. This piece part of the "Naked Light" collection within the Introspective Furniture Series.